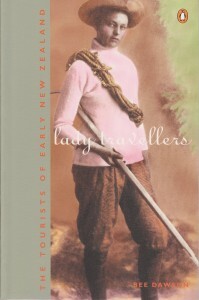 Nineteenth century New Zealand: land of Maori, mountains, fiords, forests and geysers – an exotic, far-flung frontier of the British Empire. It was irresistibly attractive to the intrepid Victorians. Explorers, missionaries, naturalists and settlers braved long journeys in small ships to go there. New Zealand was an alluring destination for those with the money and freedom to travel. Sarah Mathew, for instance, travelled around both islands with her surveyor husband, camped on unknown shores, sailed on unsavoury ships and was generally undaunted. Little Betsey Broughton survived a massacre and saw her mother murdered. Constance, Lady Ranfurly, travelled with viceregal trappings, supported by governesses, aides-de-camp, butlers, cooks and footmen. Drawing on extensive research, Bee Dawson provides a glimpse of life in the early days of European settlement. Through the eyes of twelve adventurous women we see a society that was raw, colourful, exciting, dangerous – striving to emulate the standards left behind in England.